60 innocent kids lost their lives in a shoddy Gorakhpur medical college. Surprising, no one seems to care two hoots for it though in all likelihood the disaster was well within avoidable range. What an achievement on the eve of our 71st independence day. So much noise for the ‘Vibrant India’ sloganeering that can’t even protect its children from such catastrophes. Which vibrant India are we touting about one wonders when we as a nation have failed our next generation yet again. Where are the claimants for the so called 'Super Power' tag when we are still struggling in dealing with the basic parameters of governance and public healthcare? Shame on us. Much less being ashamed of the notorious feat that we somehow have managed to achieve over decades long callousness, we now have agents of supremacists clan that are busy shaking their responsibilities one way the other. While the talking point should have been the kids that had to die for no apparent reason, we rather are busy blaming one another in a desperate attempt to come out clean. Where is the accountability? From Sidharthnath Singh to the opposition, with our media tucked somewhere in-between, it is all about blame-game. It is five days since the tragedy happened and I am yet to see a constructive comment coming from either of the quarters. If anything, the whole Gorakhpur saga depicts a sordid picture and throws much light into the reasons why we are so bad at managing the basics. But are human lives in India so cheap? Beyond the blame game there is a sorry tale that leads to the death of sixty children. It is nothing new that befall on the Gorakhpur region. It is almost a regular phenomenon with that region. From the day it was first detected in 1978, for at least four decades, the region of Gorakhpur; Deoria, Maharajganj and Kushinagar included, are at the receiving end of this deadly epidemic called Japanese Encephalitis (JE). Casualties out of this disease are quite staggering too. Every year hundreds of children die due to this one alone. But no successive state governments seem to have invested their time, money or political will to tackle this menace. A figurative number since 2012 would suggest how this repetitive killer cycle never could manage to sneak into the priority list of any state government. Had it been otherwise we would have seen improvement in numbers which is not the case. Beyond their lip service none seems too interested in acting proactively to counter this death cycle. Now one wonders what the central government was doing all this while. In 2005 the central government launched a vaccination scheme for JE. How far it got implemented across, more so in UP, still remains a big question to be answered. As early as 2013 a medical survey exposed that as many as 56% children of the Gorakhpur region never could get the desired vaccination. In a press conference the then CM Akhilesh Yadav was quick enough to lay the blame on the previous BSP government for the failure. What he as the CM did to fix the mess that the BSP government created? Well, we never could here that. Public healthcare system went down the drain during BSP government was a fact which no one can deny. How abysmal it was gets amply described by the murder of three successive state’s chief medical officers in broad daylight during BSP rule. Nothing yet has come out of the investigations of those murders but one could easily guess, the murders could be and in all probability are an attempt to cover up the awful public healthcare of the state. Moving on to the present; nothing much seems to have changed. The latest death due to JE has two folds to it. First one that exposes the mismanagement of the whole medical system that yet again raised its ugly head. The second one is the Oxygen supply that was cut by the supplier because of non-payment of dues. Both need a debate at every possible level and the responsible individuals and/or organizations must be punished. Mere blame games and complete disinterest in shouldering the responsibilities won’t help in finding the truth. While browsing through the internet on this topic I chanced upon an interesting fact. This is where the whole problem starts with our effective JE management. I am sure many may not be aware of it. Acute Encephalitis Syndrome (AES) is an umbrella term for all symptoms which cause inflammatory brain diseases. JE is a variant of the same. They could be caused by bacteria, fungi or virus of different strains which are difficult to identify individually. As a result, the World Health Organisation (WHO) in 2006, coined the term AES to signify a group of diseases which seem similar to one another but are difficult to differentiate in the chaotic environment of an outbreak. In India the chaos only gets quadrupled for various reasons, primary being incompetency and callousness. Here in India we only have an effective mechanism to diagnose JE virus. Since the cause of other diseases with similar symptoms couldn’t be established and ascertained they are conveniently relegated to AES category. This is as vague as it can get. Roughly 80% of the patients that get admitted couldn’t be diagnosed properly. That is quite a staggering number. And these are the confessions of Ms. Mahima Mittal, the head of the Paediatrics department, BRD hospital and medical college. This also explains how the AES numbers is significantly higher than the JE numbers if one looks at last five years statistics. This also explains why the JE numbers have dropped a little after the vaccination drive while the AES number is on the rise. It is on the rise because it has become a catch-all bracket for any disease whose cause couldn’t be diagnosed. Here starts the incompetency. Incompetency is a milder explanation and I am using the word only in want of a better option. All this while the government was only interested in managing JE while gave no effort in better diagnosis of other AES related diseases. An effective diagnosis would lead to better prediction and treatment and you need not be a rocket scientist to realize this. A common mistake of wrong/absent diagnosis results in confusing between Encephalitis and Encephalopathy, as admitted by a resident doctor of the medical college himself. In his own words he admitted to have carried out treatment on the basis of plain guess work that is bound to backfire more-often-than-not. While Encephalitis affects the neural system Encephalopathy has completely different effect. Wrong treatment leads to adverse results in both the cases. And imagine, we subject hundreds and thousands of our children at the mercy of a doctor’s judgment skill. Luck favours, you survive; it doesn’t, you die. Nothing can be more horrendous than this. When the same epidemic broke out in Malkangiri of Odisha, many kids died even before the doctors could diagnose the root cause. This is how we are failing our children for decades together. Later on it became clear that a proper diagnosis could have saved many lives in Malkanagiri. Now who stands accountable for this? Who should have made sure that the least the kids should be subjected to is the correct diagnosis of the disease that they are suffering from? Now comes the vital question which everyone today wants to ask – what was Yogi Adityanath and his four month old government doing? How I wish we had shown similar agility in questioning the previous governments. Anyway, let’s see what Yogi was up to other than his ‘Romeo squad’ and ‘Beef Ban’, both after he became the CM and when he was the MP from the same region. In May 2017 Yogi launched a mega state wide JE vaccination drive. Plan was to cover as many as 88 Lakh kids in about six months’ time. Our overzealous media may had their priorities on the ‘Romeo Squad’ but the first decision Yogi took after assuming office is the pending and much needed JE vaccination drive. Not only that, the state launched a toll-free helpdesk number for any kind of help regarding JE. The medical machinery on this could be reached at 1800-180-5544. Just to check I tried this number myself and got a prompt response on the critical symptoms of the disease. This is not the only instance that Yogi has acted on JE. Since 1998, he was very vocal about JE and the prevailing situation in Gorakhpur. A simple Google search would give you many videos where Yogi is seen vociferously asking the government, both the state and center, to address this repetitive disaster. He was persistent with this issue both inside and outside the parliament. Not to forget, it his efforts that brought the AIIMS to his constituency. Let’s see now see what were the governments that preceded Yogi were busy at. While addressing a public gathering in 2008 Ms. Mayawati in fact accused Yogi of only picturing the dark side of the state in the parliament for personal gain. The same sentiments were repeated by Akhilesh Yadav in another rally during 2013. Seriously? Does shying away really fixes the problem? Why can’t these two leaders see the reality rather? The powers that be who mattered the most thought addressing the plight of innocent kids is picturing the state in bad light. This is how the real cause gets lost in the political slugfest while innocent suffer their way to the grave. Had the preceding governments took it in a responsible way, rather being jittery for no reason, we may have avoided the loss of 60 kids today. Not that there were no deaths due to JE during Akhilesh and Mayawati period. The situation was even grimmer. In a traditional nonchalant 'Samajwadi Party' way Mr. Siva Kant Ojha, the then health minister in Akhilesh Yadav government, termed the death of 640 children almost a non-issue. He blamed the mosquitoes and the dirty surroundings of Gorakhpur as the main culprit and evaded the real issue. “Yogi ji ko agar itni fikar hai to who khud kuch kyun nehin karte” were the precise words of Mr. Jha while having a giggling Azam Khan by his side. This is how serious we are for a real and present danger that visits us every year without fail. And these are our leaders who are under oath to protect the interest of the citizens and ensure their safety in every way possible. And for those who ask what Yogi was doing as a MP; out of his 15 crore MP fund, he used to invest 10 crores on JE in an average. The government of India MP Website of Yogi would lay out the number as well as the segments that Yogi has utilized his MP fund. By the way, it is the Congress government that had once awarded Yogi for managing his fund the best possible way. If you are not in a tearing hurry, do spare some time in watching the video where Yogi was addressing the need of effective JE management in the state and the region. Knowing our ever callous politicians I don’t want to expect much more than evading tactic from them. That is a given and I am sure they aren’t going to change after the Gorakhpur tragedy either. They will still remain evasive and it is quite evident from the reaction coming from various quarters. What was our media doing all this while? I blame them equally if not more for the mess. Being the fourth estate they were found wanting in their duties. I blame myself and many bloggers like me as well. This is what happens when you wake up for headlines while snore around like a lousy moron at other instances. I had many posts on varied topics but can’t find a single one that questions our abysmal healthcare situation and central spending on it. I never did because I too probably was hunting around for headlines. That is as flabbergasting as it gets. Though we are even below Bangladesh on our public healthcare spending we tend to give it a miss. No one bothers much for this vital angle of governance. We spend a precarious 5% of our GDP while most countries spend double of that. We are languishing at the 145th spot among 195 countries in healthcare access but we love to look the other way. Worst even, we try to drive political brownie points from the tragedy as these two notorious gentlemen are habitual of. A tragedy on the nation makes them happy since that helps them take out their daggers against their political opponents. This is not only deplorable but inhuman as well. Who on earth would not even spare small children from their political espionage? One has to be highly insensitive to do a Shekhar Gupta or a Sadanand Dhume. For Sidharthnath Singh – sir, learn from your grandfather if you are not dead drunk with power and politics already. The person who resigned because of a train accident is having a grandson who not only is incompetent at his job but also insensitive towards small kids and their tragic death. The poor soul, our beloved Lalbahadur Shastri Ji would be turning in his grave looking at what we as a nation has ended up at in general and his grandson in particular. If not anything, Mr. Singh should be shacked for the insensitivities he showed on various TV debates after the tragedy. Shame on you sir; you deserve nothing, not even our ire. As of the Oxygen cylinders and the emergence of a late night hero/villain in all of this goes; well, it is totally inconsequential for me. You don't pay someone for two years and then blame him for not providing the required service on humanitarian grounds is a rotten socialist philosophy that I am not going to buy. Hound the scoundrels who sat over the payment than hounding the poor oxygen supplier. He wasn't doing it for charity. He too has payments to make upward and pay his employees. Dr. Khan being held has a hero and a villain, all within three hours, by two different sects is hilarious, more so when one looks at the tragedy. Let the time be the judge on Dr. Khan's act. P.S – The title picture of this post was the picture that was first shared by Hemanta Biswasharma on Twitter. 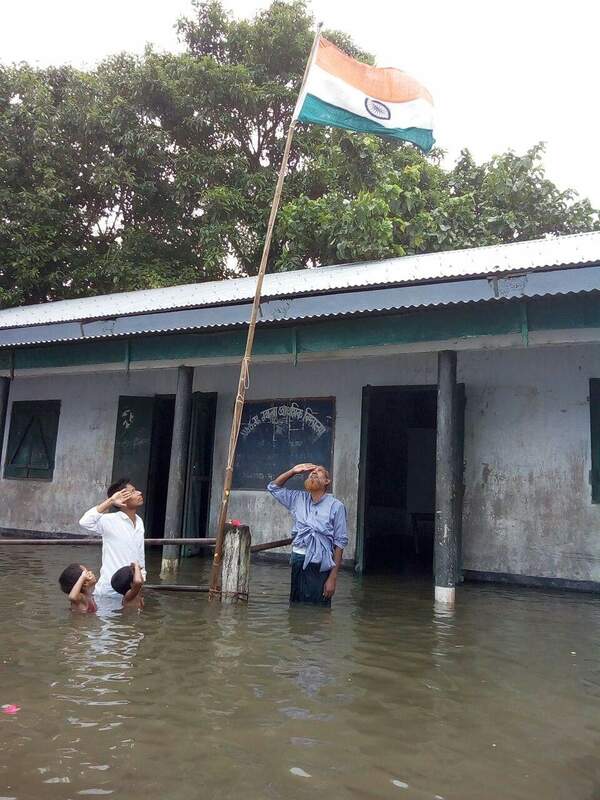 The flood may have submerged the state of Assam but it has hardly dampen the spirit. In respect of this very spirit alone I am planning to post a series of blogs on ‘India At 70’ and talk about stuffs that we as a nation are better off without. Wish you all a happy independence week.